This lovely family 3 bedroom villa in Ovacik Turkey for sale stands alone on its own plot with a large private swimming pool. It has uninterupted views of the beautiful green valley of Ovacik and is very close to the fabulous Oludeniz beach making this an ideal setting to own a property in the su for residential living or for letting out through the summer season. The villas have an open plan lounge, kitchen and dining area with a W/C on the ground floor. Patio windows lead you out onto the gardens and swimming pool. Upstairs you will find 3 large double bedrooms all with en-suite facilities and balconies. The villa is just a short walk to a selection of local bars, shops and restaurants and a 10 minute local bus ride will take you to the main town of Fethiye where you will find the large marina and plenty of restaurants along the water front. From Fethiye marina there is an abundance of boat trips available. 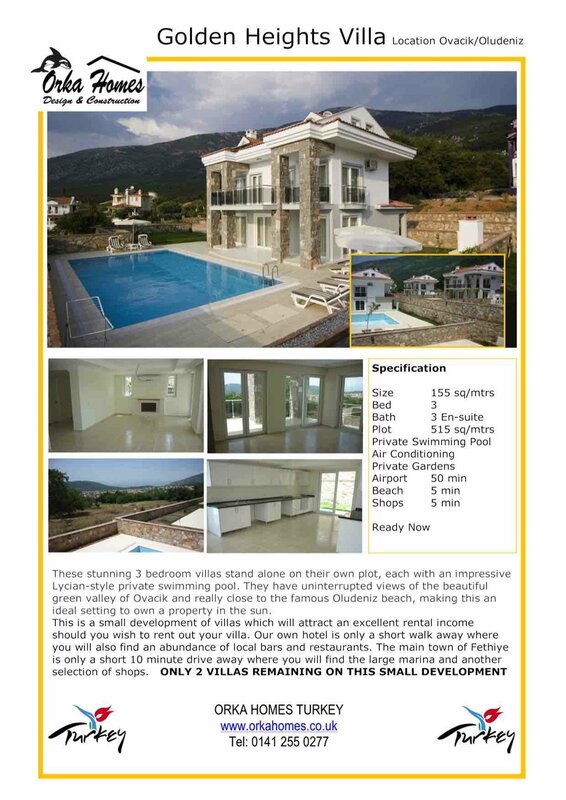 A great villa in Ovacik Turkey for sale if you are wanting either a permanent residence or just a holiday home. Great rental location and potential.